The poem is, then, a little myth of man's capacity for making life meaningful. And in the end, the poem is not a thing we see—it is, rather, a light by which we may see—and what we see is life. If you are an idealist, it does not matter what you do or what goes on around you because it isn't real anyway. The air so still it aches like the place where the tooth was on the morning after you've been to the dentist or aches like your heart in the bosom when you stand on the street corner waiting for the light to change and happen to recollect how things once were and how they might have been yet if what happened had not happened. To get there you follow Highway 58, going northeast out of the city, and it is a good highway and new. Or was new, the day we went up. My only crime was being a man and living in the world of men, and you don't have to do special penance for that. The crime and the penance, in that case, coincide perfectly. They are identical. 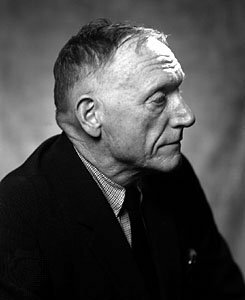 Bio: Robert Penn Warren was an American poet, novelist, and literary critic and was one of the founders of New Criticism. He was also a charter member of the Fellowship of Southern Writers.